It seems like this time of year finds our fingers all sorts of different colors. It really just depends on what we’re picking at the time. Last night was no different really. A co-worker of Emily’s has a bunch of grapes growing at her house. She has picked a ton and canned/preserved them every way she knows how. That’s where we come in. The grapes are still plentiful so she gave us a bunch of them…and there are more to pick so we are hoping to be able to go and harvest a bunch more. 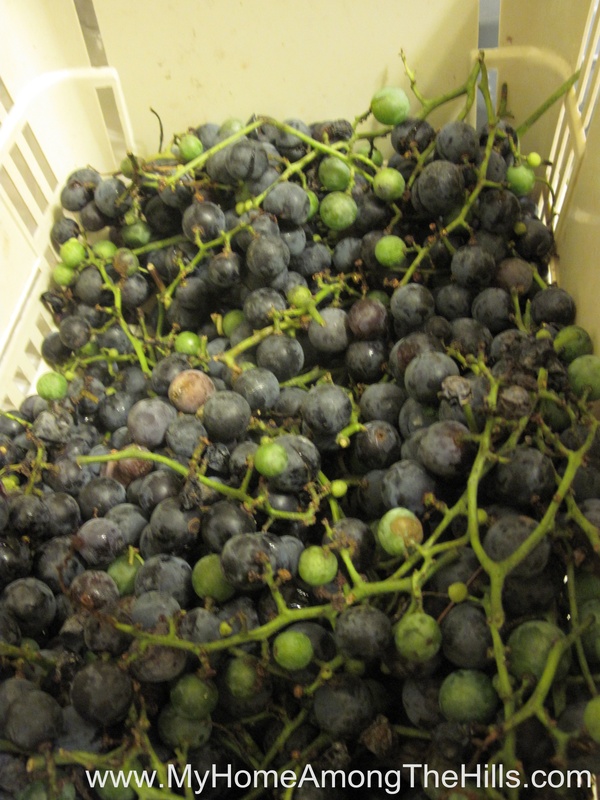 It’s hard to beat real concord grapes I think! this is just a portion! 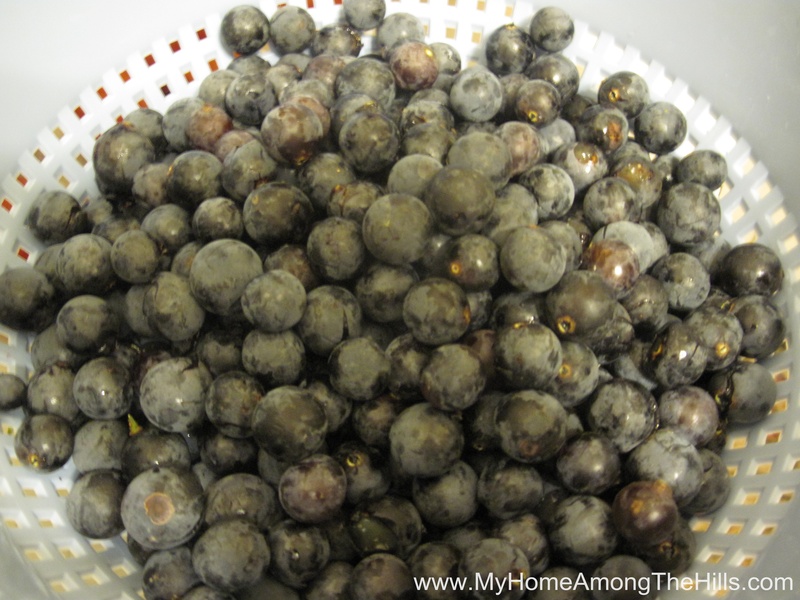 We cleaned them last night and are making grape jelly with the ones we have now. Do you remember when you were a kid and even the store bought grape jelly had flavor? I have tried some recently and it seems like the grape jelly is completely without flavor. I guess it’s like everything – homemade is really hard to beat. But gee whiz, the store stuff isn’t even fit for slug bait! Anyhow, does anyone else gather grapes? What do you do with them? I remember my Mom and Grandma canning grape juice but they always left whole grapes in the jars. It freaked me out because I could have sworn they canned eyeballs! Oh, and don’t get me started on when they canned whole tomatoes…eeek! Anyone make raisins or juice or wine? I’ve nibbled on wild grapes but does anyone do anything more specific with them? I’d love to know what options I may have! The wild grapes around here are called Mustang grapes. Not fit for man or beast. It’s too bad, too. They are large and beautiful. I’ve heard their acid level is just over the top. I’ve never had grapes straight off the vine before. You are so lucky to get some. I remember seeing a post of Granny Sue’s where she canned the leaves recently. You might want to see if she can share some of her recipes for grapes. She knows everything! I don’t remember you telling me about the eye balls….interesting. Raisins, jelly, and our favorite grape syrup for pancakes! I’ve got nothing. The only thing I have ever done with grapes was refrigerate them. Mousey has put them in the freezer for a treat! Canned eyeballs? Cool! Just kidding, I’m not that weird. I have never pick/can grapes before. I would love to have some grape plants. Those look beautiful! I’m sad that I missed our grape harvest… we were traveling and they dried out and fell very quickly. Yours look wonderful- I’ll have to try harder next year! I have the same grape juice recipe as Odie, but use a half cup sugar. I strain it before serving also. It’s delish and easy.